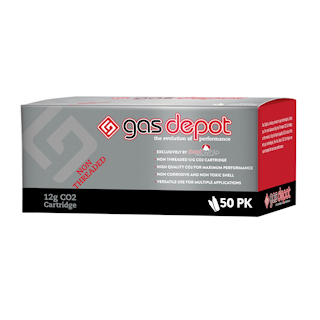 Our 50 pack of non-threaded 12g CO2 cartridges provide the most advanced method of utilizing CO2 to power and provide great performance with almost any gas-powered gun. Airguns, airsoft, paintball guns? Our cartridges have it covered. Perfect for your weekend airsoft skirmishes without worrying about faulty CO2 Cartridges. Using only the most state of the art technologies, our cartridges are specially cleaned and use noncorrosive, nontoxic shells and sealed with a welded cap until the user is ready to use.